The most lightweight Tripod: The Top 5 on the Market! Chasing after the most lightweight tripod seems to be a “sport” among travel photographers – like me, I have to admit. After climbing Huyana Picchu (that’s the big mountain in the back of each Machu Picchu photograph) I know that every pound of additional weight can actually make a huge difference! The same goes for long hiking trips through the jungle or photography excursions through the desert. But: the market of lightweight tripods is very unclear and cramped with marketing slogans (“the most lightweight tripod 2014 is right here bla bla bla!“). As I have already compiled a huge list to compare all available travel tripods and their key features out there anyway, it was easy to extract the top 5 most lightweight travel tripods as well – and below you will find the result! The first rank and by thus the title of being the “most lightweight travel tripod 2014” goes to the Sirui T-025X. With a weight of only 1.43 lb (0.65 kilograms for all you metric dudes out there) it really is a spectacular piece of photo equipment. With a compact length of just 11.80″ (30cm) it will also fit into every hand luggage you might want to carry along. You can still extend it to a maximum height of 51.18″ (130cm) which is quite good for such a compact thing. Oh, and it is made of carbon fiber – a very rare thing to be seen in this price class! The Sirui T-005X is a cheaper variant of the T-025X above (notice the difference in the numbers – I didn’t list the same one twice by accident). With a weight of 1.76 lb it is a little bit heavier and can only carry a load of 8.80 lb instead of 13.20 lb. The rest of the Sirui T-005X is similar to its bigger brother though, but it is made out of aluminum alloy instead of carbon fiber (hence the heavier weight). Rank 3 of the most lightweight travel tripods is taken by the MeFoto DayTrip. This one is a little bit different though as it has a lot fewer options compared to all other tripods presented here. It only has two leg sections to extend, which is why you can only extend it to a maximum height of 24.00″. This one is only for backpackers on a budget or very small fellas (or midgets). Although it is well-made, the features of the other four tripods presented here are way better. Ok, now we’re coming to professional gear. Gitzo tripods generally have a higher pricetag but they are so worth it if you are a pro. 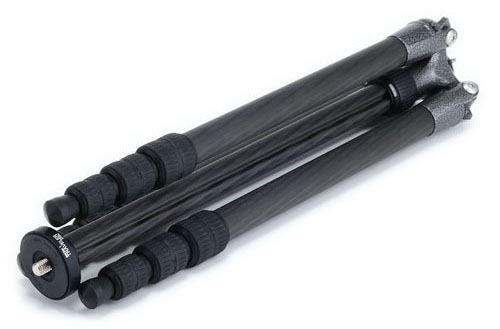 All Gitzo tripods are hand-made in Italy and made of carbon fiber. This advanced construction makes them really lightweight as well: the Gitzo GT1544T ranks #4 of the most lightweight tripods with only 2.16 lb. It’s also very sturdy with a maximum support load of 17.64 lb and has a maximum height of 55.91″. All in all these Gitzo tripods are among the best in the world, so they are well worth their higher pricetag. On rank 5 of the most lightweight tripods we have another product of Gitzo, but with a lower pricetag. The Gitzo GT1542T only weighs 2.20 lb but has a maximum height of 58.66″ – the highest one among these five tripods. It combines the compact build of Gitzo’s traveler series while having the stability of the mountaineer series – a “hybrid” if you want to call it this way. Yes, it still is on the more expensive side. But if you want a great tripod that will last for decades, this one is a great way to go! Conclusion: What’s my favorite lightweight travel tripod? Sirui T-025X: Just THE most lightweight tripod out there with a great set of features, no weaknesses and the big plus of being made out of carbon fiber. A steal for this price! Gitzo GT1542T: Although a little bit heavier than the Sirui, all other details of this tripod makes it really awesome. If you have heavier gear that a tripod needs to support, you should definitely go with the GT1542T. Both of these tripods are a great choice and I’ve had good experiences with each company’s customer service as well!